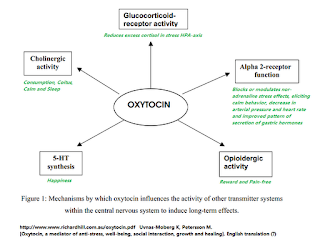 Oxytocin decreases drug abuse and cravings? 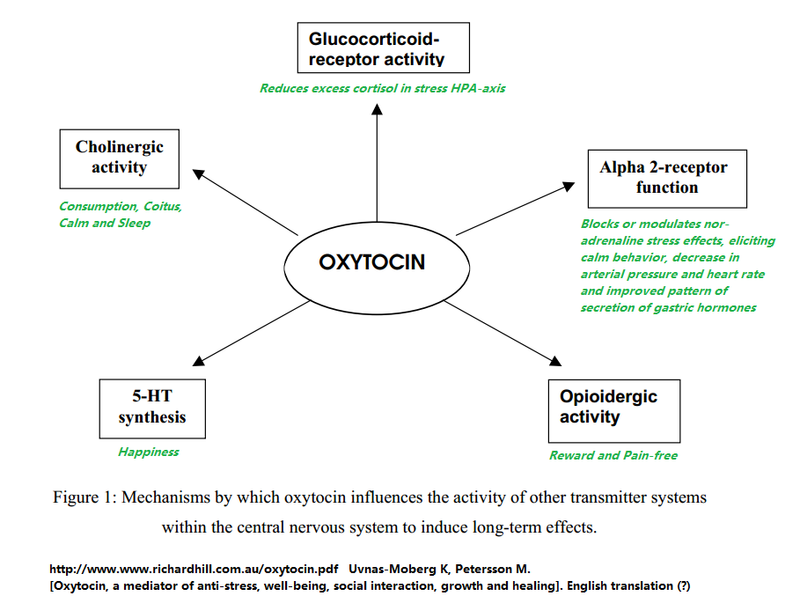 Oxytocin supports the hunter's trance? Ibo used iboga to support the hunter's trance, allowing days of static stalking. Today iboga and ibogaine are used to decrease drug abuse and cravings. Specialized focus is good (in balance of course). I wonder if someday it will be like Star Trek and we can learn to entrain our brains and bodies to do that at young ages, like Shaolin temple students, elite yogis or meditation enthusiasts? Have you heard of the locus coeruleus, a unit in the brain connected with intense focus? 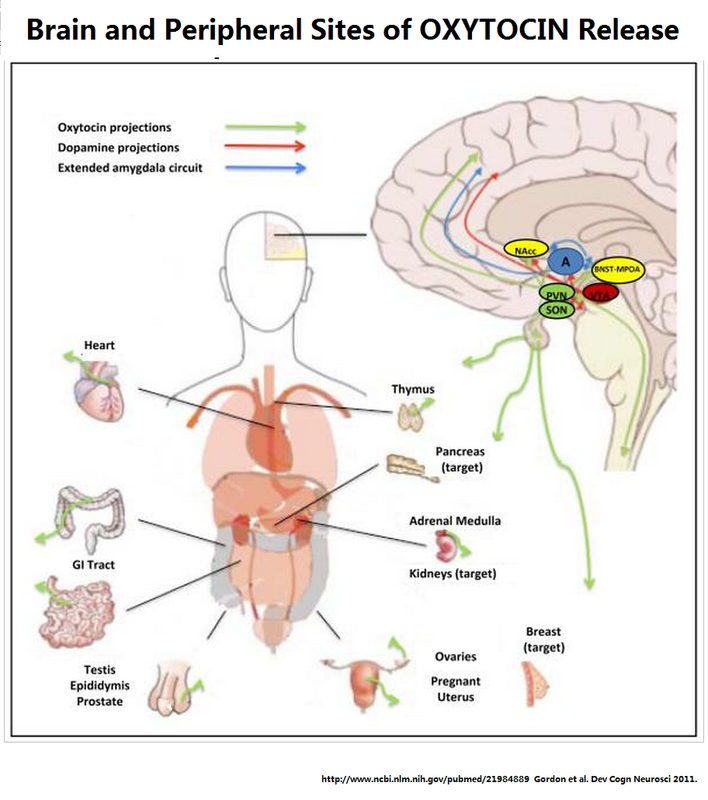 The oxytocin receptors bind NE, noradrenaline and interfaces at the LC. No doubt pharmacologically the LC can be hit but I do worry about strong agonist binding, downstream consequences, receptor regulation, negative feedback shutting it down or changing tolerance and adverse effects (?hallucinations, irreversible adverse brain changes). To me it is curious that many conditions are associated with dysregulation of the LC (adult hyperfocused ADHD, insomnia/sleep-arousal disorders, affective disorder). In schizophrenics, oxytocin is significantly low and several studies show funky differences in the locus coeruleus (low volume, increased neuromelanin, increased bilateral uptake on 18F-FDG-PET). Iboga and ibogaine are interesting because they can induce hallucinations (??? @high dose). That may not be incomparable to the auditory or visual hallucinations observed in schizophrenia and hitting similar neurotransmitter systems. "The primary function of the locus coeruleus is to regulate the amount of noradrenaline in the forebrain." On hallucinations, I have a friend who gave up a very long-term, high-dose methadone habit as a result of an overlong psilocybin trip. And I myself forgot I was addicted to opioids (back when I was) while staying awake (and fasting) on benzedrine. Many days had passed and my only withdrawal symptom was a vague sense that I had forgotten to carry out some regular act. If I hadn't picked up my next prescription I might have suffered nothing worse than mild depression from the benzedrine comedown. What both these experiences have in common, apart from the obvious, is the fasting, fat-burning state. Loving the cat bag but hoping it is not a relative. Thanks for the intersection of your psychedelic thoughts and drugs, my favorite topic, and your link!! Congratulations on your health successes. Very curious about the bennie and psilocybin stories... Replace one high with another does work. Many previously morbidly obese contemporaries (like me) replaced excessive neolithic-eating/gluten-casein-exophorphins with another addiction (working out, endorphins, yoga +/- coffee). I'm living in China home of prior opium trading with the UK, as well as two subsequent Opium Wars (1839, 1856). (Apparently Britain is growing their own again, but on home soil) Maybe opioid peptides are so intrinsic to our DNA and expression because its function underlies many if not ALL of our most human behaviours, besides being a substance/resource worth nations to fight over. Your phrase 'fat-burning and fasting'... They definitely supercharged big brained carnivorous hominids (erectus, sapien, neanderthal)...and they made us dependent on endogenously produced opioids. Anorexia is subconscious and involuntary starvation, much like that induced by bennies or other drug trips (e.g. 'being in love', honeymoon phases *haa aha*), right? Actually anorexia maybe autoimmune just like everything else... anti-ghrelin auto-antibodies apparently track well with the disease and remisison. Anorexics also have high cortisol and high CRH. Beta-endorphin appears dysregulated both high or low, but may normalize as patients recover. Cortisol/CRH (stress hormones) and involvement of the HPA axis naturally and evolutionarily serve the foundation of regulating the three phases of starvation. It probably happened with great frequency over the last few ice ages... Cortisol/CRH are ANCIENT like insulin. To maintain blood glucose (BG) in adequate concentrations for the brain and liver (even with steadystate ketosis), the liver needs cortisol for GNG. This is why so many kick into adrenal dysfunction doing so many of the things we love in paleo land, which can sometimes then spiral into intestinal impermeability, infections (candida often), poor immunity, FODMAP intolerance, and blah blah blah. No worries...fake as can be ;) It's funny all our cats love bags and the crunchiness of plastic bags (we cut the handles sometimes so they wouldnt choke). You always make me laugh! That is a great strategy!!! A hunter does need to assess new terrain and ecological niches... Seeing green is so soothing, no? I know people who have the pattern of quitting drugs or alcohol when they start a new relationship, only to fall back into old ways once the "high" wears off. Very interesting 1992 endorphin paper. Question; need exorphins reach the brain to be addictive? I was just thinking along these lines these days. In a very simple way though.